[G Guardian](Usable when both fighters’ vanguards are grade 3 or greater, and the number of face up G guardians in your G zone is three or less)-Opponent Turn’s Guard Step-[Choose a card with “[Heal] Heal” from your hand, and discard it] Call this card to your (GC) from face down. [AUTO]:[Counter-Blast 1 & Choose one of your rear-guards, and retire it] When this unit is placed on (GC), you may pay the cost. 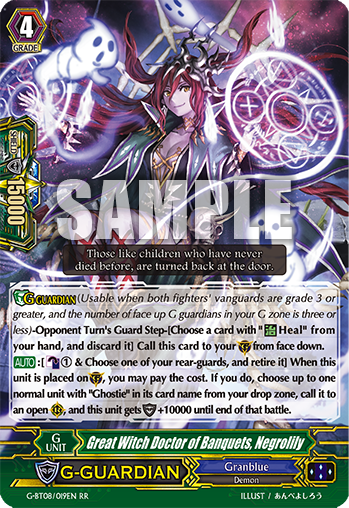 If you do, choose up to one normal unit with “Ghostie” in its card name from your drop zone, call it to an open (RC), and this unit gets [Shield] +10000 until end of that battle.